I was sad about the news of a cute Japanese boy, Reo, who was killed by jellyfish in last new year eve, just 3 days before his fifth birthday. 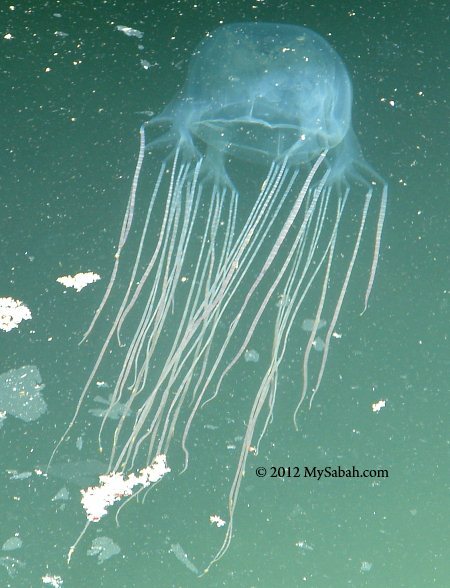 Such incident is not new and I had mentioned the danger of jellyfish in my article Dangerous Animals of Sabah in 2011. As more tourists flow to the beautiful islands of Sabah, by knowing the following hidden threats, you can avoid a joyful island trip being turned into a tragedy. Jellyfish is the No.1 creature to avoid in water. Though you should stay away from ALL of them especially those with long tentacles, not all jellyfish is fatal. The species that have killing tentacles, particularly to children and elder people, are the Box Jellyfish (Chironex sp., aka Sea Wasp) and Ubur-ubur Merah (Red Jellyfish). Dr John Madin, a tropical marine ecology expert from Universiti Malaysia Sabah, identifies three of 16 jellyfish species found in the waters off Sabah’s west coast as deadly; they are: Chiropsalmus quadrigatus, Chiropsalmus quadromunus and Carybdea rastoni, which are belong to the box-jellyfish family locally known as “balung api”. Unfortunately, jellyfish is hard to spot due to its translucent body. You may not know its presence until you feel the acute burning sensation of its stung. Even though some says there is a “Jellyfish Season”, you should stay vigilant at ALL TIME in the sea. Remember, we are sharing the nature with wildlife, and the ocean is not our backyard swimming pool. 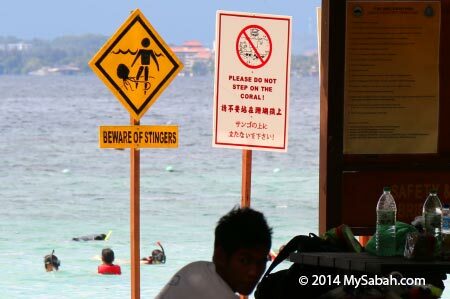 Pic: popular island destinations in Sabah have warning signage about jellyfish. There are over 300,000 visitors to all Sabah islands annually, so 1 or 2 cases of attacks suggests that such incident is not common. Even so, most tour guides and travel agents will aptly warn the tourists. If you still very worry, you may wear full body swimming suite. 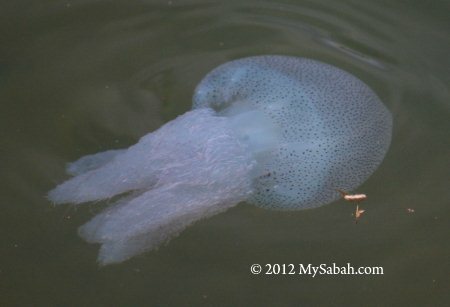 Sabah ladies seldom get stung by jellyfish because our shy females always wear T-Shirt and long jean, a lame swimming outfit but prevents stung. If you are stung by a jellyfish, rinse the wound with vinegar (acetic acid) and seek medical care immediately. Vinegar can deactivate the stinging cells but it is NOT a CURE to neutralize the toxin. Most life guards on islands have vinegar standby. Someone may advise you to rub sand on wound or wash with urine. Don’t Do it, as these unproven measures can worsen the situation. 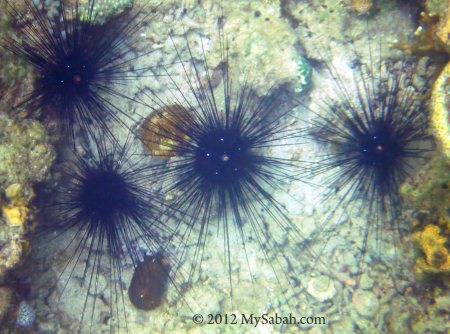 Watch your steps in the water, as sea urchin is quite common among corals in shallow sea. Its needle-like and poisonous spines can puncture your skin and cause swelling and serious pain. The worst case is – the spines penerate deep under your skin and break off. You will need hospital to remove the spine fragments for you. The toxin is usually not deadly, but certain people may have allergic reaction to it. 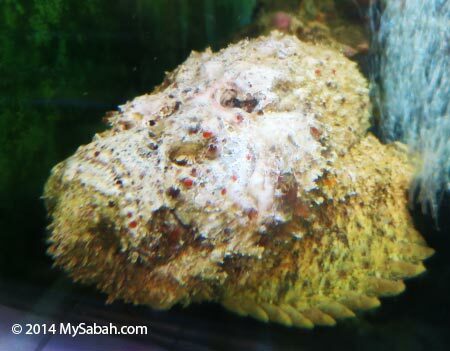 Stonefish is one of the most venomous fish in the world. I shivered when I read the excruciating pain of a stonefish victim below. 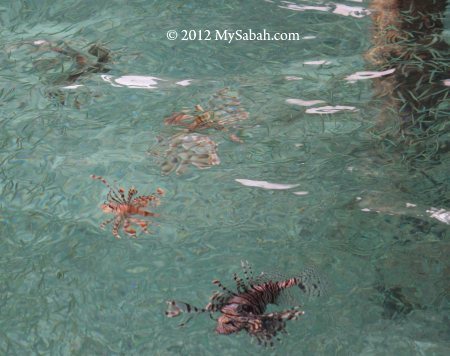 Pic: can you spot the stonefish? The nasty dorsal fin spines on the back of stonefish are not the only dangerous thing. What makes stonefish truly dangerous is its perfect camouflage that looks like stone. This fish doesn’t come after you and bite you. It just sits quietly among the rocks, without warning, a person would step on it accidentally and punctured by its spines filled with potent neurotoxins. If untreated, the victim can die. When you walk in the water of rocky shore, just wear shoes and shuffle your feet while walking. If you are stung by stonefish, just go to hospital quickly for anti-venom and I believe you will need a lot of painkillers. Stingray is like a fish that holds a dagger. Stingray shocked the world when it pierced the heart of Steve Irwin (aka “The Crocodile Hunter”) with its barb in 2006. Swimming with stingray was used to be an exciting activity of divers and now we know it’s unwise to mess with stingray. 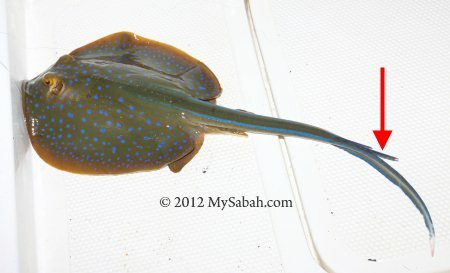 Pic: stingray, note its barb at the tail. 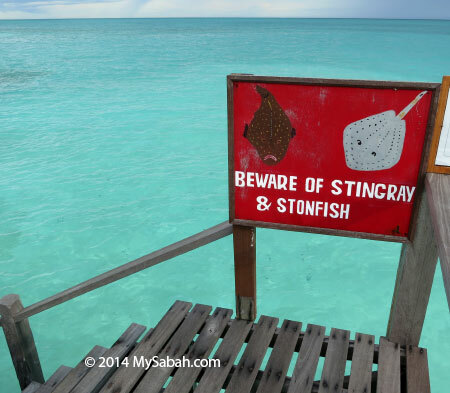 Luckily, stingray is not common in popular beach frequented by tourists. When settling, stingray will hide itself under the sand and hard to see. If you are the first one entering the water of a remote beach, you may shuffle your feet to avoid stepping directly on a stingray, and don’t walk into murky water. When being stepped on, stingray will stab your foot with its sharp barb near the base of the tail. Its sting also injects protein-based venom that causes extreme pain (can last for hours). Its barb is so hard that it can puncture boots. Normally the stung is not fatal, but if you experience nausea, breathing problem and other unpleasant symptoms, look for a doctor fast. 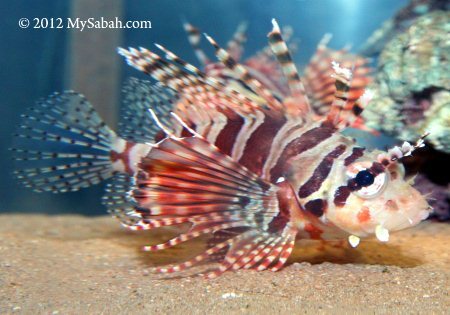 The list goes on, like banded sea krait, striped eel catfish, lionfish, blue-ringed octopus… Well, don’t worry, all of them are passive and won’t harm you unless provoked. Leave them alone and you will be safe. Pic: striped eel catfish is small but scuba divers are very afraid of them. 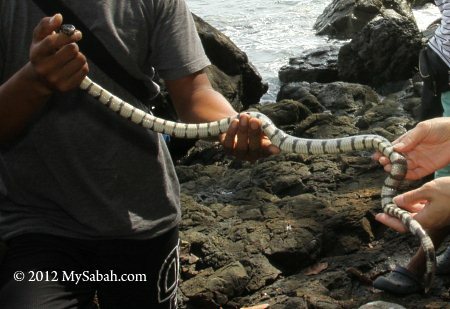 Pic: banded sea krait is highly curious but not aggressive. Oh ya, shark, I almost forgot about shark because it is my least concern. 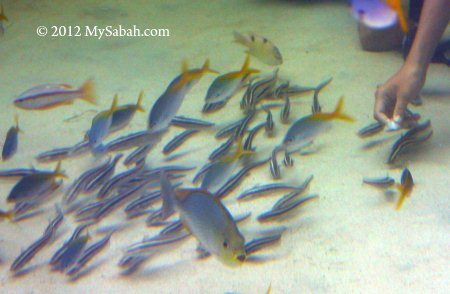 You find mostly small sharks in Sabah ocean. 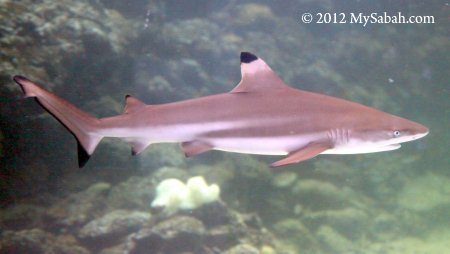 The bigger sharks live in deeper water of Sipadan Island (Reef Shark), Lankayan Island (Bull Shark) and Layang-Layang (Hammer-Head Shark). They are more like a delightful sighting for scuba divers than man-eaters. Again, just leave them alone and you shall be fine. They have plenty of food in our sea, so human is not on their menu. Always keep an eye on your children who play in the sea. Actually you should worry more about drowning than those creatures. Let them put on life jacket. Before having fun swimming and snorkeling, always check with the guide or resort staff on the sea safety and consult them what to do if accident happens. Besides, throw them some “What-If” questions about emergency cases. If they look blur and lack of training (e.g. CPR), you should be prepared for any accident and know where is the nearest hospital, and do express your concern to their management. 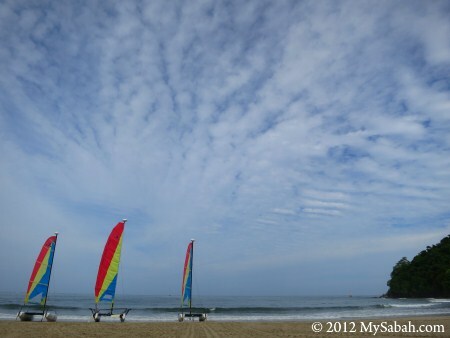 Sabah is perfectly safe for your island holiday if you are aware of the potential danger. The dangerous marine creatures are just part of the vibrant ecosystem of our sea. Asking question like “do you have nice beach without jellyfish?” is same as asking “do you have beautiful jungle without snake?” If you want it 100% safe, please swim in bathtub at home then. Have you heard any terrible story caused by these creatures? Please tell me more.